I loved Keith Wright for Hibs. This man was born to play centre-forward for our team and appeared to know it, revelling in every minute as soon as his career took him Easter Road way. Very much an old-fashioned leader of the line and a dynamic presence around the penalty area with a good shot in either foot and considerable power in the air. It’s a great pity that he didn’t arrive at the club earlier as was much mooted in that era but Keith really took the bull by the horns when he got there and helped lead his team to its first silverware for many years. One of the best-loved Hibees of all. This comparison is perhaps a little unfair as Tony Mowbray has potentially many years of top-class management in front of him whilst Eddie’s is well-documented. It’s my view that Eddie Turnbull is occasionally looked on through rose-tinted spectacles but this should not detract from his great success and knowledge. Never a man to suffer fools gladly and with an abrasive manner and tongue to match, Eddie knew what he wanted of his team and ruthlessly set out assembling it. It’s easy to look back upon his mistakes in tearing apart his wonderful Tornadoes but it’s perhaps the former he should be remembered for. He also did a great job and proved himself in Aberdeen for a period too. Tony Mowbray swept into Easter Road as a non-entity managerial wise. He soon went about changing that and with an approach that was heavily philosophically and psychologically based, began gaining an appreciative and interested audience within the Hibs support and general media. Mowbray had his weaknesses in perhaps only having one approach to the game, whatever the circumstances, but boy was it fun while it lasted. 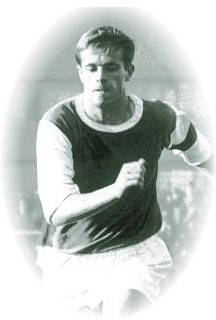 Hibs were no less than scintillating at times under his tutelage. Time to look at the final score line then. It’s close – very close, and in the final analysis and not without a little irony its ‘Ned’ himself, Eddie Turnbull that makes for a swinging 70s’ victory! All this means little though and instead rests with the best traditions of a good old-fashioned bar-room debate about our mostly erstwhile Hibs Heroes. Every reader of this will no doubt have their own views and counter-arguments. That’s why we just love this game isn’t it? With apologies to the following aces that narrowly missed the cut. As an Aberdeen fan who caught Eddie Turnbull’s last season in charge at Pittodrie and watch many matches between a declining Dons and the Tornados, I enjoyed this entry. I remember Theo Snelders getting sent off for punching him for an alleged dive to get a penalty and then booting the ball out of the fround. Cheers Ken, I’ll alter that. Agreed, it was a great time for football and the Don’s had some superb sides just before that decline you mention. Can’t remember the Theo-Keith incident but that sounds quite a moment!